Ice cream, ice cream, ice cream. My two-year-old has been chanting this phrase most of the day. It's definitely ice cream season in my household. Every member of my household has their favorite flavors: my kids love anything with chocolate, I prefer frozen yogurt, and my husband always loves weird mix-ins like potato chips. We can all agree that no matter how it's made ice cream spells summer. During the colder months ice cream rarely makes an appearance in my house. It can get very cold here in the middle of winter and when I'm freezing the last thing that I want is something to make me even colder. In the summer it's a different story. I roast in the humidity and ice cream is a great way to cool off. Another of my favorite summer foods is tomatoes. This year I am growing my own, they are growing like crazy and by next week they should be ready to pick. In the meantime I have been relying on store bought tomatoes. Last week I tried a new recipe for Marinated Cherry Tomato Salad from allrecipes.com. This recipe has 8 ingredients. It takes 2 hours 10 minutes, 10 minutes of which is active and makes 6 to 8 servings. I did make a few modifications. First I only had two cups of cherry tomatoes, so I cut the recipe in half. Second, I substituted olive oil for vegetable oil. I prefer cooking with olive oil when possible. Finally, I allowed the salad to sit 4 hours to ensure that the tomatoes fully absorbed the flavors. My oldest son thought these tomatoes were spicy. The vinegar taste is definitely adult orientated. As an adult I really like the taste of the apple cider vinegar. It blended very nicely with the tomatoes and the recipe made a nice light side for the pasta dish that we ate it with. Overall, a great way to use summer tomatoes. For the recipe go to Marinated Cherry Tomato Salad. I'm a big fan of tomato salad as well, it just screams summer! My tomatoes are almost rip, hopefully within the next week. We had a cold spring too so we are a little behind as well. Before too long though I should have a bunch! Potato chips in ice cream? That's a definite first lol. I think we've had ice cream here every day for about a week and a half. I do love cherry tomatoes and with this salad, I'm positive I won't get bored! Our tomatoes are almost ready to pick! I will be trying this recipe for sure. What a great salad to enjoy. I've been making ice cream and frozen yogurt all year round. :P So, I love serving more veggies and fruit as entree to balance out. This is such a treat. I eat ice cream pretty much year round too :) I agree with you about eating more veggies to balance out the occasional ice cream treat, I do the same thing. This looks so yummy. I can see myself eating a bowl of this on the deck this summer for sure. Thanks :) I love sitting out on the deck or porch in the summer! Love tomato salads and have eaten these for a long time. Just bought a few bunches of cherry tomatoes from the fruit stand on the corner here in NYC. I like mixing mine with blasamic vinegar. I'm with you on the balsamic vinegar, it is so good on so many things! Mmmm, I eat cherry tomatoes all the time for easy snacks. I love your pictures too! I eat them for snacks as well, they are one of my kids favorite foods. They are small and easy to eat! This is right up my alley ;o) Tomatoes are my favorite (especially cherry)! I make tomato and feta salad all the time; I'm obsessed! Thanks for sharing! Feta and tomatoes are great together! Oh,this looks delish! Id love to try this. Its great that summer is on.Here in my country, rainy season is in full gear. We are definitely at opposite times of the year :) Followed you back! This looks so good, but I needed you three months ago! Our season in Florida is already over, I will be saving this. Our season was late here, we had snow at the end of April. Our weather can be pretty unpredictable with when the last frost will be. OMG I love tomatoes! We're growing some in our teeny tiny garden. If anything actually grows I will be trying this out! Tomatoes are a big favorite in my house too, they are great in so many dishes or just plain! Yum. We love marinated tomatoes and cherry tomatoes. They are so tasty and we often put them on a pizza. Thanks for sharing this particular marinade. 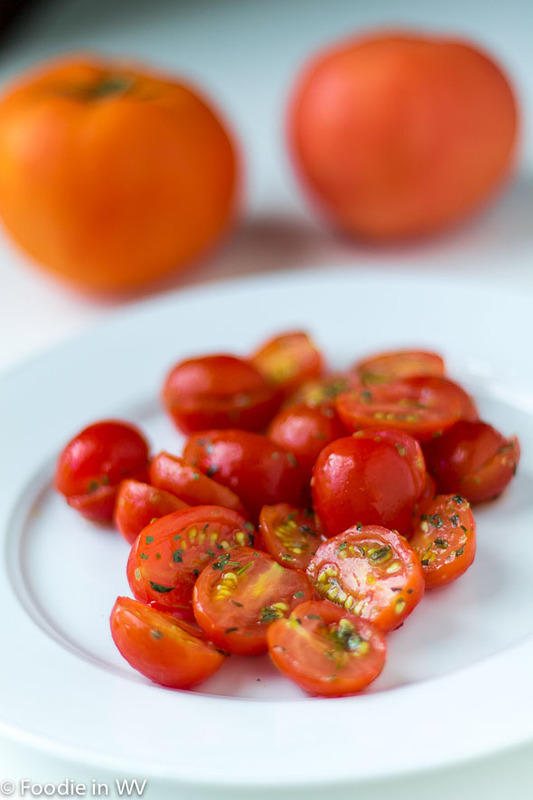 Marinated tomatoes are a favorite of mine too, a great way to celebrate summer! I love tomatoes. They taste wonderful a bit of sea salt, and some herbs and nice balsamic oil. I am full from dinner and your pictures makes me want to have a plate of tomato salad. Tomatoes and Basil are a favorite around this house in the summer. Can't wait for mine to finish growing! This salad looks delicious. My basil has been growing like crazy this summer :) Still waiting on my tomatoes though! We decided not to plant a cherry tomato plant this year so I guess I will be going to our local farmer's market! Mine are almost ripe and my kids are stalking them every morning checking to see if they are reading yet :) Thanks for hosting!